adidas' New SLVR S-M-L Concept Shoes, Now We've Even Got Footwear Specifically Designed For Dealing With Airport Security | OhGizmo! Almost every laptop bag manufacturer now has a version that’s claimed to be airport security-friendly, meaning you don’t actually have to remove your laptop from the case when it passes through scanners and x-ray machines. And since it’s now the norm for everyone to have to also remove their shoes when dealing with security, it looks like footwear manufacturers have taken a cue from the laptop bag makers. adidas’ new SLVR S-M-L Concept shoes are not actually a concept, but are available for sale ($140) from adidas’ SLVR online store in just three sizes: small, medium and large, hence their name. Based on the description on their website the shoes are the perfect accessory when flying since they feature a 4-way stretch mesh upper making them particularly easy to repeatedly slip on and off, or stash away in a carry-on bag. And because even the soles of the shoes are stretchable, it allows adidas to release in them just 3 unisex sizes covering everything from men’s UK size 4 to 12. I’m a fan of Adidas. I like their cleats and wore their running shoes for quite a few years. But you can’t make a shoe that fits a wide variety of feet that will actually feel comfortable unless you fall in the middle of the range. I’ve never seen these shoes up close, but they’re probably missing some important components in a good shoe i.e. a shank or heel counter. So if they’re used for slipping on and off at the airport and you aren’t going for long walks or running in them they may feel good. Wear them around the house for some cushioning if you have tile, vinyl, or hardwood floors. 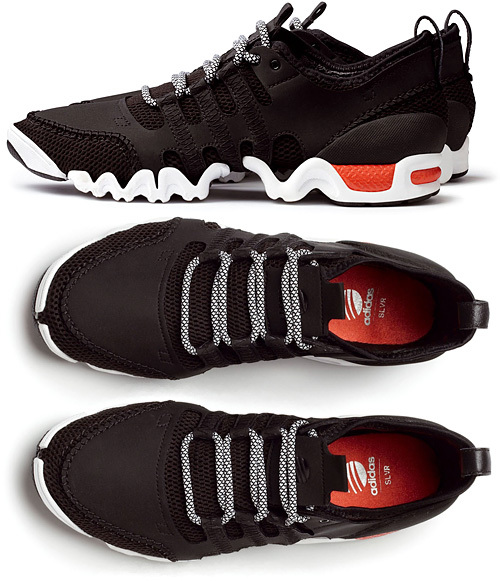 But if you want that kind of shoe with better fit and function, you could always look at a triathlon shoe, slip-on, or go out and buy elastic laces for your runners and it’ll do the same thing. But what do I know? It’s not like I’m a foot care professional.